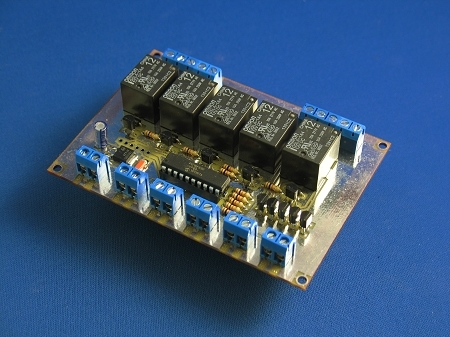 Latching interface board for Knight Rider KITT or KARR replica builders. Intended use is to convert any momentary push button into a latching type. 5 independent circuits on the same board. Relay contacts rated 10A. Relay coils are hardwired into printed circuit board to output 12Vdc when energized. Board size is 5.0 x 3.0 inches or 126 x 75 mm.